4. DEDICATION; Dedication is sowing yourself as a seed into your purpose. Every seed is a potential harvest, but until it is sown, it will remain a just seed. As tiny as the mustard seed is, when it is sown, it becomes a tree, but if it is not sown, it will remain just a tiny mustard seed. In same vein, if you don’t sow yourself into the purpose you discover, the greatness(harvest) in you will never come alive, and it takes dedication to sow yourself into purpose. Dedication is impossible without the help of the Holy Spirit. Dedication is what makes you keep doing same thing without giving up despite not having anything to show for it, and that’s only possible by the help of the Holy Spirit. So many people have given up on their purpose due to lack of dedication, they got tired of the routine because they don’t have access to the Holy Spirit that can help them get dedicated. While some others kept at their purpose by the help of the Holy Spirit and their greatness show forth. Your greatness shall show forth in JESUS name. Amen. DEDICATION IS THE PATHWAY TO FULFILMENT OF PURPOSE. IT ENTAILS GOING BEYOND YOUR BEST TO FULFIL PURPOSE. NO ONE CAN EVER BE GREAT WITHOUT DEDICATION. 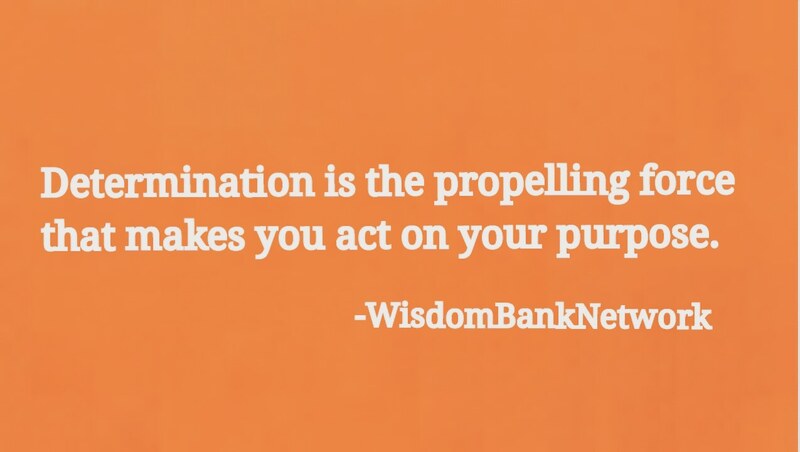 THEREFORE, BE DEDICATED TO YOUR PURPOSE…BE WISE…!!! 3. DETERMINATION; Determination is the propelling force that makes us fulfill purpose. It is action that actually gives value to determination. We may have good decisions and have clear directions, but without determination, it will yield no result. Until we are determined to ACT on our Decision and Direction, we will not be able to fulfill purpose. It is determination that gives value to Decision and Direction. It is determination that force us to take steps towards fulfilling purpose, irrespective of the challenges on our paths, it makes us see every challenge as an opportunity to get to the next level in life. Determination is also enhanced by the help of the Holy Spirit(just as decision and Direction). Have you not noticed that you have determined to do so many things which you have not attempted at all? This is because, it may be in your power to determine, but it is not in your power to act on your determination. We actually do not have the power to act on our determination, we must seek the help of the Holy Spirit to do what we have determined to do. IT IS ACTION THAT GIVES VALUE TO DETERMINATION, BUT IT IS THE HOLY SPIRIT THAT EMPOWERS US TO ACT ON OUR DETERMINATION. THEREFORE SEEK THE HELP OF THE HOLY SPIRIT TO EMPOWER YOUR DETERMINATION…BE WISE…!!! 2. DIRECTION; After making decision, direction is the next requirement for fulfilling purpose. It entails knowing the right steps to take to fulfill the purpose. If we look intently at Ecclesiastes10:15, we will find out that knowing where to go, but not knowing how to get there wearies(or frustrates) a lot. Many people have made right decisions but lack the direction to actualize the decision, and therefore get frustrated. It is the Holy Spirit that can give us accurate direction required to fulfil purpose. We are incapable of directing ourselves. Proverbs14:12 explains that there are ways that seems right to us, but leads to destruction. Isaiah48:17 further explains that GOD(through HIS Spirit) is the one to teach us to profit and to lead us the way to go. Therefore, we should learn to always seek the help of the Holy Spirit to direct us on how to fulfil purpose. 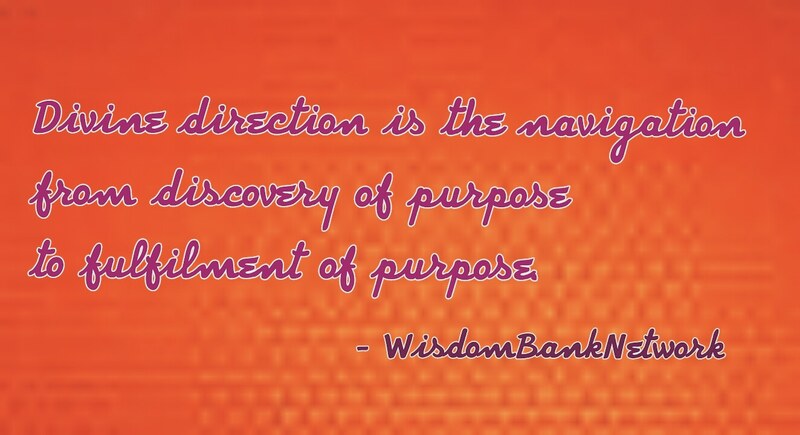 DIRECTION IS THE NAVIGATION BETWEEN DISCOVERY OF PURPOSE AND FULFILMENT OF PURPOSE. THEREFORE, ALWAYS SEEK DIVINE DIRECTION…BE WISE…!!! By the help of the Holy Spirit, we were able to look into how to discover purpose. But it is not enough to know how to discover purpose, it is much more important to know what is required to fulfill the discovered purpose, which I have captioned “Five Ds of purpose”. Today, we shall be looking into the first “D” of success. 1. DECISION; The decision you make about the discovered purpose determines the success or failure of the purpose. This implies that fulfilment of purpose is a product of right and quality decision Everyone is a product of his or her decision. 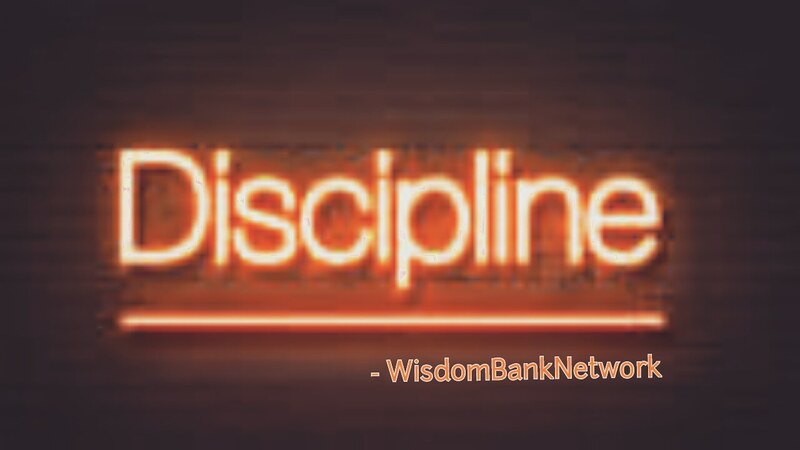 Your decision today is what determines your condition tomorrow. Many people have discovered purpose, yet they do nothing about it, they procrastinate and complain things are not working. Everyone of us, no matter how wise we are, are incapable of making right decisions without the help of the Holy Spirit. It is the Holy Spirit that enables us to make right decision, because the Holy Spirit reveals the way GOD wants us to carry out the assignment HE has sent us, because HE knows the mind of GOD~John16:13. THERE IS NO WAY YOU CAN FULFIL PURPOSE WITHOUT MAKING RIGHT DECISIONS, AND THERE IS NO WAY YOU CAN MAKE RIGHT DECISION WITHOUT THE HELP OF THE HOLY SPIRIT. 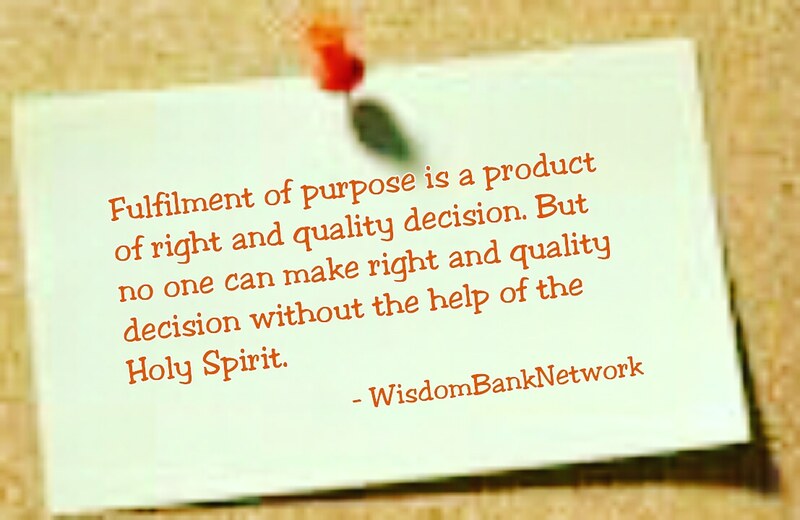 THEREFORE, ASK THE HOLY SPIRIT TO HELP YOU MAKE RIGHT AND QUALITY DECISION TO FULFIL PURPOSE…BE WISE…!!! You just mustn’t return to GOD without doing what HE has sent you here to do, without fulfilling purpose. Therefore, you must discover purpose. By the help of the Spirit of GOD, we have been able to look at various ways of discovering purpose, such as “Prayer”, “The word of GOD”, “Passion” and “What you love to do”. Today, we shall be looking at another way we can discover purpose. 5. LOOK INWARD; One of the ways of discovering purpose is by looking inward. If you observe very well, you will discover that there is something you can do very well that is needed by others and that others can’t do. GOD have deposited such into everyone of us, to make us need each other. So, there is something in you that the world needs, that is your purpose. The ability to discover that thing is what results in success and fulfilment in life. YOU DON’T HAVE TO RUN FROM PILLAR TO POST TO DISCOVER PURPOSE, JUST LOOK INWARD AND CAREFULLY OBSERVE YOURSELF VERY WELL. YOU WILL DISCOVER THERE IS SOMETHING OUTSTANDING ABOUT YOU, YOU WILL DISCOVER PURPOSE…BE WISE…!!! 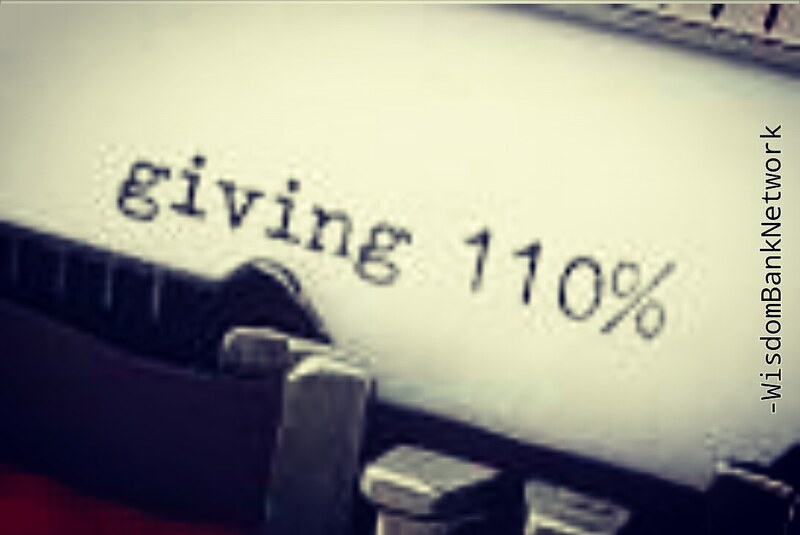 Living a purpose-driven life brings fulfilments. Therefore, it is paramount to know how to discover purpose. By the help of the Spirit of GOD, we have been able to look at “Prayer”, “The word of GOD” and “Passion” as ways of discovering purpose. Today, we shall be looking at another way we can discover purpose. 4. 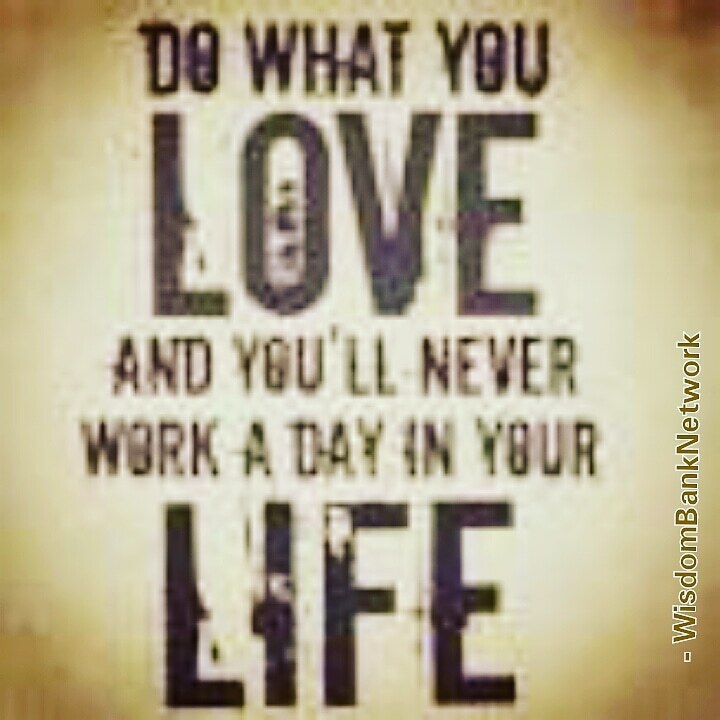 WHAT YOU LOVE; The truth is that GOD did not create you to do what you don’t love, HE created you to do what you love. GOD cannot create you to dislike what HE wants you to do, but to love what HE wants you to do. There is always something you love doing, there is something you derive so much joy in doing, that thing is what you are created to do. A young man approached his friend and started to complain about how life have been unfavorable to him. His friend simply asked him what he loved doing, he told him, and his friend advised him to stop everything else he was doing and start doing what he love to do ONLY. He obeyed, and today he is being patronized all around the nation and he is impacting lives. That’s definitely his purpose! GOD HAVE PLACED THE LOVE OF SOMETHING IN YOUR HEART, WHICH MAKES YOU FEEL FULFILLED. THAT THING IS WHAT YOU ARE CREATED TO DO. THAT THING IS YOUR PURPOSE…!! !